Law for Life / Research and theory / When legal rights are not a reality: do individuals know their rights and how can we tell? Self-reporting of rights knowledge remains problematic. The findings of this study by Catrina Denvir, Nigel J. Balmer and Pascoe Pleasence indicate that people over-estimate what the law entitles them to, or misread the legislation, in other cases people under-estimate their entitlements. The challenges in getting a clearer picture of legal knowledge in the population stem partly from the research methodologies used, but are also due to the sheer complexity of the ways in which people describe and make sense of the law. When asked whether an individual knows their ‘rights’, does their perceived knowledge equate to an understanding of their legal position? How do questions of social logic, fairness and morality implicate what people believe to be their position when asked about enforceable legal rights? From the perspective of educational interventions these questions offer some critical purchase on the ways in which people think about the law and the strategies they employ to articulate their needs and manage disputes. As educators, that means recognising that the corollary between legal knowledge and effective rights claiming is not as clear as it might seem. 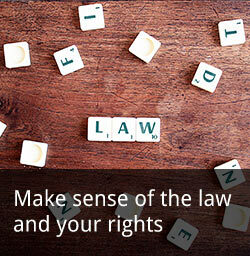 In some situations very basic but broad brush legal knowledge accompanied with strong negotiation skills can be a better indicator for success than being able to remember a specific piece of legislation. In a complex administrative and increasingly ‘outsourced’ world, the positions and capacities of the actors involved means we need to consider how legal knowledge is deployed by ordinary people in different settings. For example, knowing how local housing policy functions and knowing the right official to speak to may be a better option than reciting regulations to a call-centre operator. The message at this juncture is that there is much more to be done both in the field of delivering education and information about the law and the multifaceted strategies that everyday encounters with the law require (simplistic approaches to self-help information are not the solution), as well as a pressing need for further exploration through studies that help us to understand how people make sense of the law.